A migrant essential or a criminal marketplace? Since the “refugee crisis” exploded across the international media and political landscapes, the role of social media has been repeatedly dissected, argued over, and—more often than not—misunderstood. Although officials and politicians often present new digital platforms as security threats that enable traffickers and illicit enterprises, these technologies also have played a critically important role in aiding refugees, asylum seekers, and migrants in need. They help people connect to the outside world from inside detention centres, provide desperately needed information about sources of humanitarian assistance, and enable the creation of digital communities that give migrants and their loved ones’ agency to proactively search out solutions. 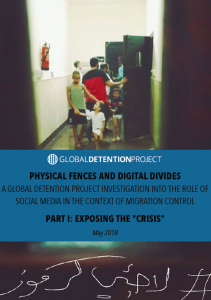 This Global Detention Project Special Report is aimed at improving our understanding of how people use social media during their migration journeys, with a special emphasis on their use in the context of detention and migration control in North Africa and the Mediterranean. Part I, “Exposing the ‘Crisis,’” charts the historical relationship between migration and social media, reviewing the various tech responses to the “crisis” and highlighting the importance of human-centred design of new technologies. Two subsequent installments in this series will include on-the-ground reports of the diverse ways people put social media to use during their migration journeys and provide recommendations for human rights practitioners who wish to harness social media in ways that emphasise harm-reduction.